Readers Question: Sorry I’m really confused on how the weak oil prices affects EUR/USD currency. I’ve tried searching for articles but there are really different arguments. For EURO – Weak oil prices worsens Eurozone inflation therefore European bank ,to prevent deflation and boost economy will continue with their negative interest rates and Quantitative easing which increase in money supply > hence causes EURO currency to depreciate . However for US – I’m quite confused..I know that oil prices are denominated in US dollars. However,how does it affects US currency ? Which will weaken against the other more ? Firstly, with exchange rates there is no easy answer. You will have several factors all contributing to the exchange rate, but they can go in different directions. Fall in value of currencies which are tied to commodities. For example, Canada, Australia, Saudi Arabia, Mexico, Russia produce commodities. The fall in price of oil and commodities will be bad news for their economy. Less export revenue, therefore, lower value of currency. As Europe is a net importer of oil and commodities, the Euro will tend to rise in value against these currencies. Is the US a net importer of oil? The US is poised to be a net exporter of oil, with oil exports close to matching oil imports. (FT) The US has invested a lot in shale oil. The fall in the price of oil will be bad for some aspect of the US economy and the dollar may be adversely affected. 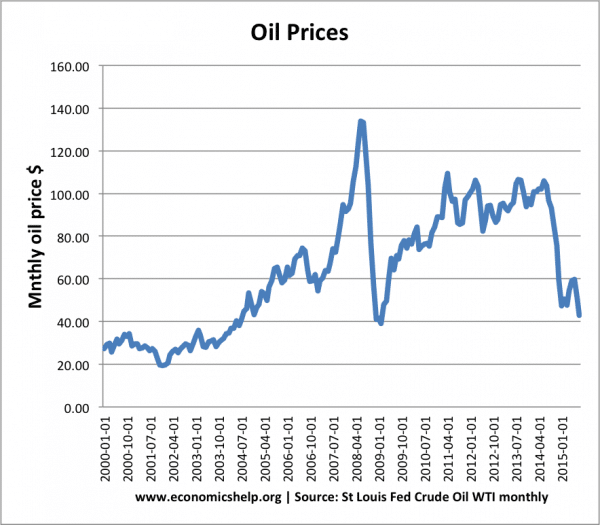 However the fall in the oil price is not a major problem for the US. It imports as much as exports, and lower oil prices help US consumers. But, relatively to the Euro, it is not a major net importer, so you might expect the Euro to marginally increase against the Dollar. Changes in expectations of economic recovery. Lower oil prices may provide a boost to depressed EU consumer spending and this could make investors more optimistic about EU recovery, and EU monetary policy could change to higher interest rates in future. Euro recovery. 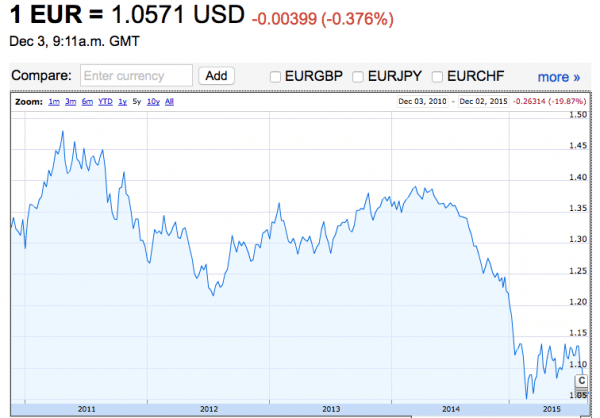 The Euro has declined in previous years due to fears over recession and Euro debt crisis. Therefore, all the bad news may already be reflected in the value of the Euro. Therefore, we could see a recovery in the value of the Euro as investors feel it is not going to get any worse. Often movements in exchange rates don’t reflect fundamentals (like changing interest rates) because investors are trying to predict these in advance. Often it is simply a correction to exaggerated movements. Low inflation. If Eurozone inflation is relatively lower than US inflation, then EU goods become more competitive and we would expect rising demand for EU goods. This will have the affect of increasing the value of the Euro in the long-term.